PRISM director Carl Norgard and lead investigator Kelley Kennedy were interviewed on Halloween 2012 on Omaha, Nebraska's Q98.5 FM on the Pat & JT in the Morning radio show. Several new EVP were played on-air. CLASS A EVP - #SLAVIC (6/8/05) - This EVP was recorded on an Olympus W-10 digital audio recorder by PRISM founder David Pierce Rodriguez on June 8, 2005, while taping a short interview with jail manager Ryan Roenfeld regarding the deaths that have occurred in the Historic Old Pottawattamie County Squirrel Cage Jail in Council Bluffs, Iowa over the years. At the end of the interview, jail manager Ryan Roenfeld says, "That's really about all the prisoner deaths we know about ...not very many of them." After saying that, a click is heard followed by a male voice saying something unintelligible. Immediately after that, the interview comes to an end, both David and Ryan can be heard laughing and talking. Both David or Ryan did not hear the click or the voice. The ale voice was only later heard when listening back to the original digital recording. Listeners have identified what sounds like a Slavic male voice. a 3D spectrogram (top area), and spectrum (bottom bar). Located at 226 Pearl Street, Council Bluffs, Iowa and built on the former site of a morgue for the Episcopalian Church, the Historic Old Pottawattamie County Squirrel Cage Jail located in Council Bluffs, Iowa, was constructed in 1885 and closed its doors as a prison in 1969. The jail was purchased by the Historical Society of Pottawattamie County in 1979 and became what is now a museum. The jail is known as the "Squirrel Cage Jail" because of its unique three-story rotating jail cells. The jail is part of the National Register of Historic Places, and is one of only three remaining Lazy Susan jails. Prisoners were housed in pie-shaped cells, which were accessed by turning a hand crank until the cells lined up with a single door on each floor. Unfortunately, the jail does not rotate any more, and some of the pie-shaped cells have not seen the light of day for almost forty years. The building is believed to be haunted by the ghost of one of the former jailers that worked and lived at the jail. While employed at the Squirrel Cage Jail, the jailers and their families lived in an apartment located on the fourth floor of the jail. Four deaths are known to have occurred at the jail. One prisoner died of a heart attack, another prisoner was found hanged in his cell. The third death was of a prisoner who tried to climb up the jail cage to try and write his name on the ceiling. He fell from the third level and died. The fourth death was during the Farmer's Holiday Association strike of 1932, eighty-four protestors were arrested and taken to the jail. Out of fear that the angry farmers would storm the jail and set the prisoners free, the police department used machine guns to turn the grounds of the jail and courthouse into a "no-man's land". One officer died during the confusion after he shot himself inside the jail. The following photograph was taken on the 3rd floor of the Squirrel Cage Jail by John Russo in April 2013 during an overnight investigation of the Squirrel Cage Jail with the UNO Paranormal Society (UNOPS). The image on the right is from the original photo on the left, and has been zoomed and brightened for detail. The photo shows an apparition of a shadow figure and what PRISM and Squirrel Cage Jail staff believe to be the ghost of one of the jailers that used to work in the jail. This EVP was captured on an Olympus W-10 digital audio recorder by PRISM founder David Pierce Rodriguez on June 8, 2005, while taping a short interview with jail manager Ryan Roenfeld regarding the deaths that have occurred in the Historic Old Pottawattamie County Squirrel Cage Jail over the years. At the end of the interview, jail manager Ryan Roenfeld says, "That's really about all the prisoner deaths we know about ...not very many of them." After saying that, a click is heard followed by a male voice saying something unintelligible. Immediately after that, the interview comes to an end, both David and Ryan can be heard laughing and talking. Both David or Ryan did not hear the click or the voice. It was only later heard back on the digital recording. Listeners have identified what sounds like a Slavic male voice. an animated 3D spectrogram (top area), and spectrum (bottom bar). Ovilus PX ITC Device Response (10/19/12) - GET OUT! Inventor Bill Chappel's, Ovilus PX "ghost box", is an experimental device used for Instrumental Transcommunication (ITC) experiments. It's computer-generated speech is derived from energy changes in the immediate environment. This amazing response was recorded on the Ovilus PX on October 19, 2012 at the Old Pottawattamie County Squirrel Cage Jail in Council Bluffs Iowa in jail cell #7. PRISM investigators Kelley, Bo and Jeremy, UNO investigators John and Carrie, and Q98 contest winners Jenn, Ryan and Brent, were all present. John asks the PX Box if it wants Carrie to leave. The answer is "YES, GET OUT!" ITC: Mobile Phone Call (10/20/12) - GET OUT! At 12:09 AM on the night of October 20, 2012, during our paranormal investigation of the Old Pottawattamie County Squirrel Cage Jail, one of our PRISM investigators received this mysterious call on their cell phone. Unexplainably, the phone number was listed, not as a number, but instead as the words, "GET OUT". Because of the haunted nature of the Squirrel Cage Jail, we believe that this may possibly be evidence of Instrumental Transcommunication (ITC). It must be noted, that this mobile phone call message correlates with the response we received just minutes earlier in Cell #7 on the Ovilus PX device. This EVP was captured at 12:34am on July 2, 2005 on four different sources. It occurred when the PRISM team was sitting on the floor of the main room on the 4th floor of the jail. An armoire door swung open and hit PRISM's founder David P. Rodriguez on the arm. The EVP was recorded at the same exact time. Two of the recorders used were different model Olympus digital audio recorders and the other two were video cameras, one was a Sony Handycam, and the other was a video camera used by the KPTM Fox News crew. The EVP heard is a Darth-Vader-like sounding male voice. What is being said is unknown, though it does sound like "??? to the backside of the church". Note that PRISM investigator Renee C. can be heard speaking over the EVP saying, "I saw it open." One interesting fact that we found out after recording this EVP is that the building directly behind the jail, what is now the Pottawattamie County Annex, used to be an Episcopal Church until the 1970's. Could the Squirrel Cage jail be the "backside of the church" that the voice is talking about? This EVP (Electronic Voice Phenomena) was captured on October 19, 2012 on the main floor of the Old Pottawattamie County Squirrel Cage Jail in Council Bluffs, Iowa. Investigators for PRISM present were Kelley and Bo Kennedy. Tina, one of the Q98.5 contest winners was also present at this time. We captured a female voice saying what sounds like either, "I can see her" or "I'm right here". Note: In the audio clip below, you will hear the original audio recording, followed by the isolated EVP looped three times. This is video footage from a Sony Handycam and a Fox News camera of the door swinging at the same time that an EVP is captured. David had been rocking the chair back and forth for an approximately 10 minutes before this event happened. We tried to debunk this later, but were unable to recreate the door opening while rocking the chair. Note: This short video shows 2 clips from 2 separate cameras that were filming at the time the incident occurred . The first CCD video camera had no mic. The second video camera that belonged to the KPTM crew did have a mic, and the EVP can be heard. KPTM Fox 42 News reporter Dave DeJohn and photographer Jason Pressler joined the PRISM paranormal research team and founder David Pierce Rodriguez on an overnight investigation of the the Historic Old Pottawattamie Squirrel Cage Jail and Museum. The footage was later presented by news anchors Taylor Wilson and Tracy Jacim on KPTM Fox 42 News "Prime Assignment" in Omaha, Nebraska. The video aired on July 1, 2005. PRISM along with members of the UNO Paranormal Society were back to investigate the Historic Squirrel Cage Jail in Council Bluffs, Iowa on October 19, 2012. PRISM investigators present were Carl Norgard, Kelley Keneddy, Bo Kennedy, Brian Heath, Kevin Potter, Jeremy Anderson and Lisa Krasso. UNO Paranormal Society investigators present were John, Dave and Carrie. Q98.5 contest winners present – Jen, Ryan & Brent Udron, Tinna Asp, and Kim & Dennis Moy. The investigation started at 8PM and went until 1AM. The weather was clear and dry. Several interesting anomalies were caught on video during the investigation. This photo started it all. It is the reason we started investigating the Squirrel Cage Jail in the first place. Taken by PRISM founder David Pierce Rodriguez, on March 19, 2005, and shows what appears to be a male apparition on the 4th floor office located on the North side of the jail. Several photos were taken on the same day, from the same location, and of the same set of windows, but this outline of a man only showed up in this one single photograph. On the right is a photograph of Otto Gudath. He was a jailer at the Old Pottawattamie County Squirrel Cage Jail in Council Bluffs, Iowa from 1949 to 1958. Could the apparition seen in the 2005 PRISM photo be the ghost of the late Otto Gudath? PRISM director Carl Norgard and PRISM investigator Kelley Kennedy were interviewed on Q98.5 FM (Omaha, NE) on the Pat & JT in the Morning radio show. They spoke about the Squirrel Cage Jail investigations and several of our EVP recordings were played. Staff writer Courtney Brummer with The Daily Nonpareil teamed up with investigators from the Paranormal Research and Investigative Studies of the Midwest (PRISM) for a four-part series on haunted places in southwest Iowa. This report focused on investigations conducted at the Historic Pottawattamie County Squirrel Cage Jail and the Villisca Ax Murder House. Film producer and director Paul von Stoetzel recorded interviews with PRISM founder and lead investigator David Rodriguez and PRISM investigator Dan Christianson for his new documentary film with the working title, Roadside Attractions. Locations included both the Squirrel Cage Jail in Council Bluffs, Iowa, and the Villisca Axe Murder House in Villisca, Iowa. PRISM was featured in Southwestern Iowa's The Daily Nonpareil newspaper on July 19, 2005. The article entitled Fox 42 To Air Ghost Hunt spoke about PRISM's televised paranormal investigation of the historic Old Pottawattamie Squirrel Cage Jail. A story on PRISM founder David P. Rodriguez and PRISM's paranormal investigation of the the Squirrel Cage Jail was featured on the Coast To Coast AM web site in their Hot Stories section. Coast To Coast is a national late-night radio show hosted by Art Bell and George Noory. The radio show is is listened to by millions of listeners each night and all kinds of paranormal topics are discussed. PRISM was featured on the front page of the Independence Day edition of Southwestern Iowa's The Daily Nonpareil newspaper. 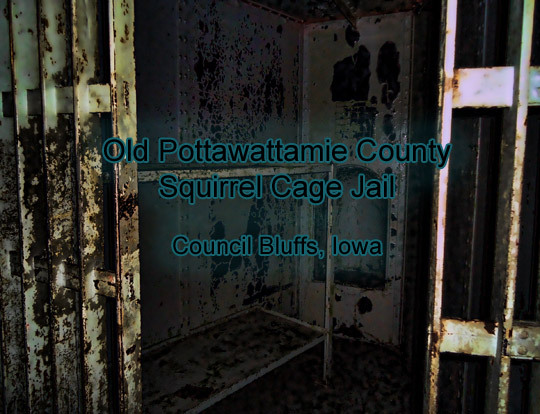 The article, written by Tom McMahon, and entitled Paranormal Researcher Investigates Jail spoke about PRISM's paranormal investigation of the Old Pottawattamie Squirrel Cage Jail. Reporter Dave DeJohn and photographer Jason Pressler joined PRISM on an overnight investigation of the Squirrel Cage Jail. The footage was later presented by news anchors Taylor Wilson and Tracy Jacim on KPTM Fox news "Prime Assignment" in Omaha, Nebraska.